Today I faced an olive with some hard love. It had to be done. 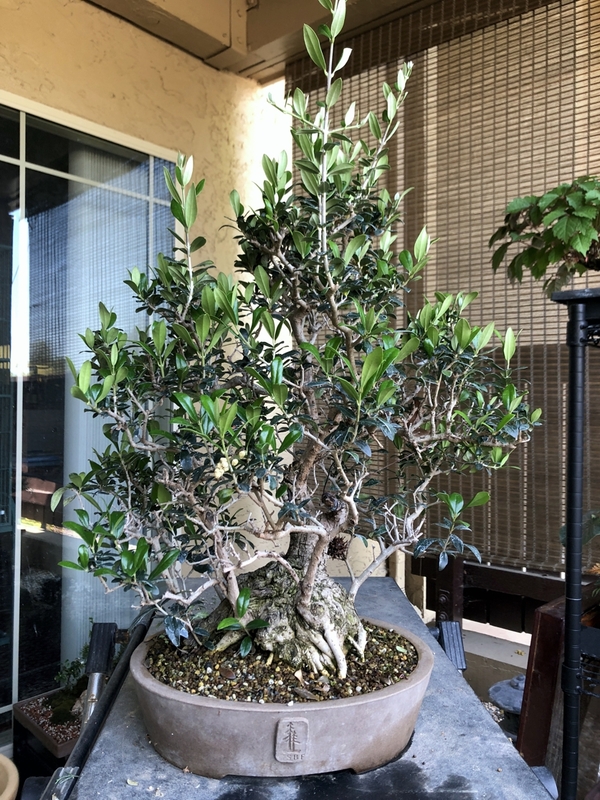 Last year all of my olives were re-potted and as usual they sulk and loose material. They have grown well in the overly warm winter to put out extensive growth. That growth; however, was not even and I lost considerable internal foliage and branches.The exterior would have to be greatly reduced. 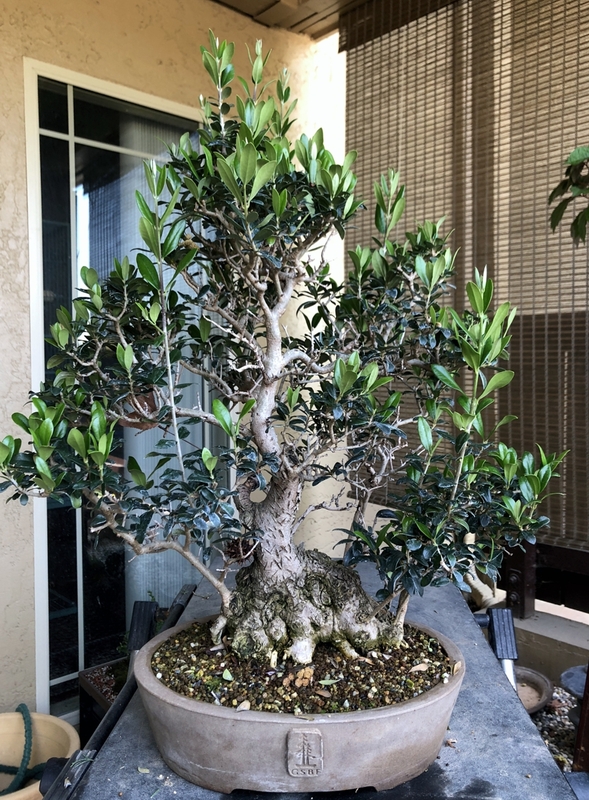 2018 Olive: Imagine this tree as a 6 foot tall bush. That is where it started. 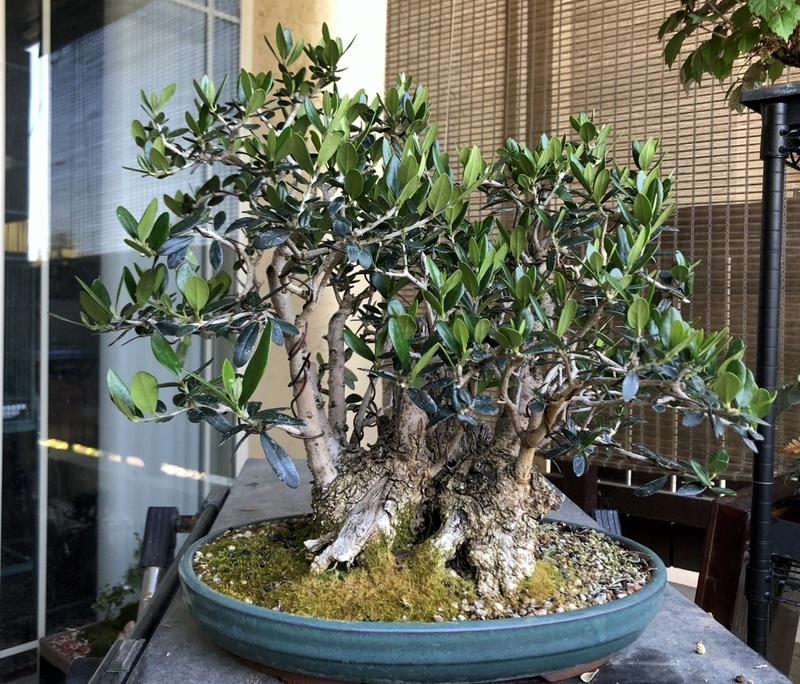 Last summer in grumped through its re-potting and recovered to strong growth during winter and early spring. It lost a great number of internal branches and ramification is only on the ends. This has to be corrected. To gain back inner growth the trees foliage must be severely reduced to allow sun and air inside the tree. Olives are prone to attach by white fly and scale. This take considerable energy out of the tree. In my area, if I did not nearly defoliate the tree its thick foliage would be covered by white fly eggs. By thinning out the foliage I am able to spray and treat the trees so they will not be overtaken. Dead branches have been removed and after taking the next photo I tied down some branches.Olive scare easily so I use extreme care in wiring. 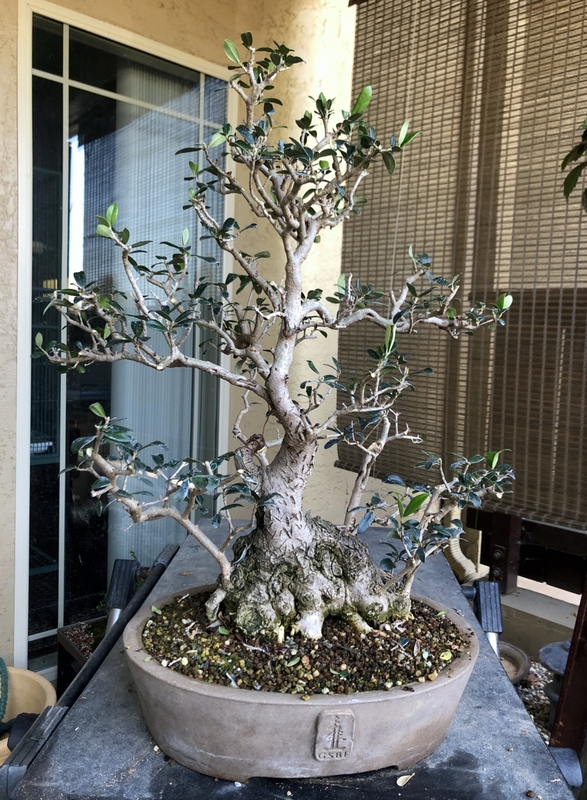 2018 Olive Re-imagined, after heavy pruning, branch reduction and before tie down wires. This is a massive reduction to recover inner foliage and better ramification. 2018: Olive stump. This tree was also developed from bush taller than myself. Now the foliage on the right is fantastic but the left side still needs ramification. 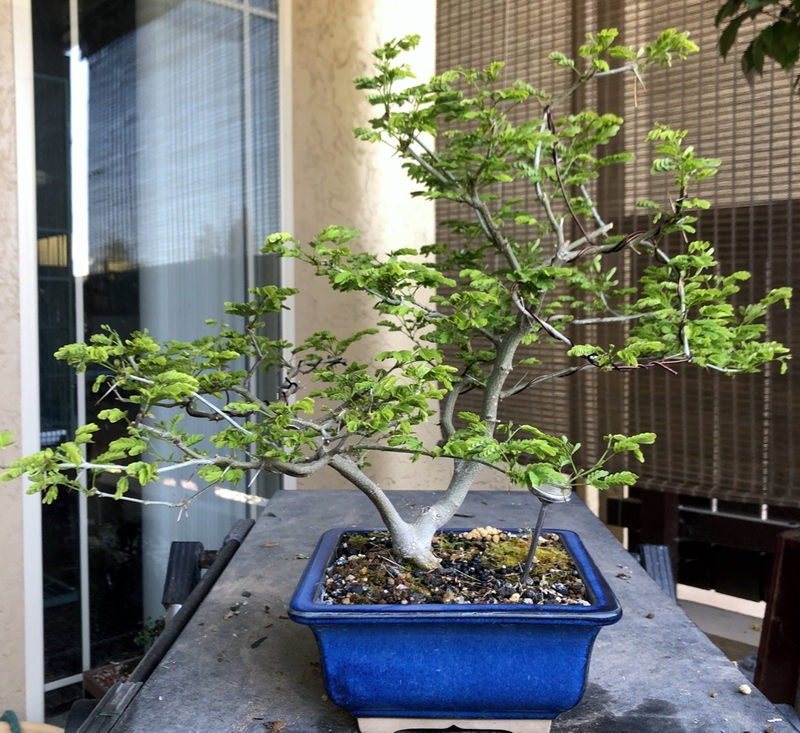 2018 Brazilian Raintree putting on new foliage after the winter shed. 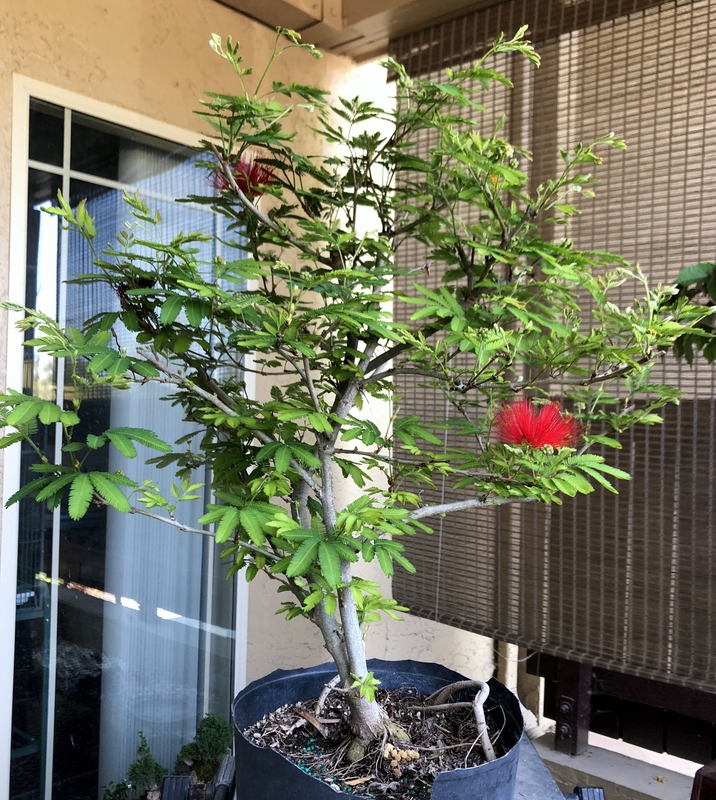 Calliandra Tweedi in bloom, It will be moved in to bonsai pot soon for the first time.